Since the early '90s as the guitarist with Rage Against The Machine, Tom Morello has changed the way people view the electric six string. But lately it's the sound of the acoustic that floats his boat. He's already put out two albums under his folk-based alter ego The Nightwatchman, and he has lots of other songs waiting to be be recorded. As he sees it, that's just fine. Writing and recording his own material is where Morello sees his career headed. Where he doesn't see it, apparently, is with Rage Against The Machine - at least as far as the studio is concerned. The seminal rap-rock band reformed in 2007 after a seven-year break and have put on blistering live shows all over the globe, but when it comes to recording a new album, Morello says, "There are no plans for that." Morello tells Billboard that the acoustic-strumming, protest song-singing Nightwatchman guise is his principal musical focus for the remainder of his life. "From the earliest days of playing open mic nights at coffee houses, it was apparent to me that this music was as important to me as any music I've ever been involved in," he says. "It really encapsulates everything I want to do as an artist." Still, he doesn't regret reuniting with Rage, and the door is open to do more with the band - to a point. "We've had a wonderful year and a half of playing shows, and I don't see any reason to not play more shows," says Morello. "The thing is there's only so many hours in the musical day, and mine are very occupied right now." And he with did on the second Nightwatchman album, The Fabled City, Morello is filling out his live shows with a full band, and he's even busting out some of his trusty guitar pedals too. In his view, "I'm able to do everything I want as a musician under this tent." 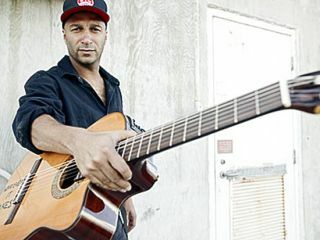 Check out MusicRadar's recent podcast interview with Tom Morello here.